Sometimes Outlook thinks part of my message is part of my signature and no spelling check is done. How can I tell Outlook to change a section from signature to normal? Right clicking always shows me all my possible signatures and never the spelling mistakes. If I copy and paste, Outlook still thinks it is the signature. I have found my only option is to retype everything! 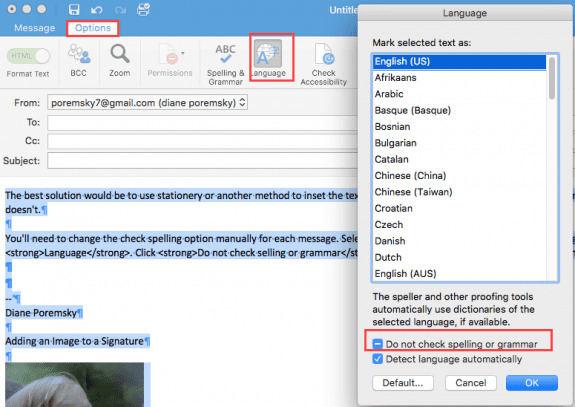 If Outlook is not correcting misspelled words and spell check is enabled, you are typing in the signature area. You can confirm it by right clicking on the misspelled words - if the signature selector comes up you're typing in the signature block, not the message body. If you have accounts that you do not want to use a signature on, create a blank signature that contains just the dashes & space to use when you don't want to use a signature. Why two dashes? The RFC’s recommend using it to separate the message from the signature. Note: the RFC specifies two dashes followed by a space: "-- " as the signature separator. Adding the dashes to the signature won’t help you with the current message though – to fix spell check in the message, you can select all and cut the message body (including the signature) then use Paste Special, As Text to paste it back into the message in plain text format. Note: this will remove formatting, images, and hyperlinks from the message. You can select just the text you typed and Cut it (Ctrl+X), then use Paste Special, as text to paste it in the message body area above the signature, if you know where the signature begins. Or press F7 to run spell check manually on the entire message. If F7 doesn't check the signature, you will need to change the style so that it doesn't skip text when checking the spelling. 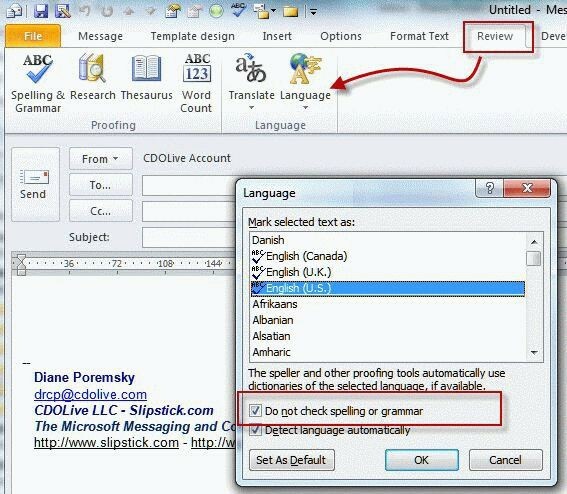 In Outlook 2010 and above, select the entire message body (Ctrl+A to select all) switch to the Review tab, Language button, Set Proofing Language command and remove the check from Do not check spelling or grammar. 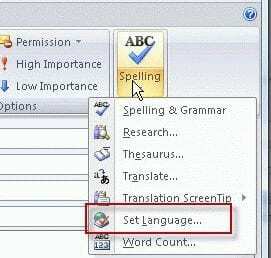 In Outlook 2007, expand the Spelling button and choose Set Language. The Set Language dialog is identical to the one in Outlook 2010: Deselect the Do not checking spelling and grammar option near the bottom of the dialog. We use signatures to add prepared text to a message. When I edit the text, spell checking doesn’t work. How can we fix this? The best solution would be to use stationery or another method to inset the text, not signatures… if only the Mac version supported stationery or autotext. Unfortunately, it doesn't. You'll need to change the check spelling option manually for each message. Select the entire message then switch on the Options tab and click on Language. Click Do not check selling or grammar twice to remove the tick and spell check the entire email. Big thanks to Dave McCulloch. That fixed my O365 issue!! I discovered a very convenient solution, at least in Office 2016. By deleting the hidden "_MailAutoSig" bookmark (Insert / Links / Bookmark / check "Hidden Bookmarks" / select "_MailAutoSig" / click "Delete" button / click "Close" button), all signature text becomes part of the message's body. Thank you! I've had several lines between the body text and signature, but it diddn't matter. However for decades have used Word with the formatting visiable and Outlook has driven me nuts since '95, I learned how to correct my signature "AND" turn on the formatting! Thank you so much for suggesting a simple fix. My spell check doesn't respond at all with right click besides the word being highlighted, SOMETIMES. If it's the first word or last I'm typing, it correct the spelling if wrong. Most importantly everything with these computers have improved so much, why isn't spell check just activated within the windows 10 home system. It's not only a outlook issue, it's facebook, it's on everything. I get about 10 different ways to look into correcting, all for the tech savy. oh did I spell that wrong? It corrected the I.
Yeah, every program has its own spell check.. while it would be nice if there was one built into windows and all apps shared it, I'm not expecting it to happen. it's easier for developers to handle their own spell check rather than trying to keep up with changes in a shared spell check. If you have set all of the settings correct and the issue continues, then this problem is created because you have a bloated temp file. Navigate to the location of your Outlook mail file (e.g. - "C:\Users\username\AppData\Local\Microsoft\Outlook", where username is your account name). Rename your current temp file, which is safer than deleting it. Close Outlook and restart it. A new temp file will automatically be created and your spell check will automatically run for you again. Hi Everyone I train MS office and this has been a pain for me. I also use Signatures to speed up the replying process. I have now solved my issue. 1. I created a new signature BLANK,only has (--). Make it Default. 2. I open new email and get the (--), type above it. 3. When finished I scroll to the (--) and delete and insert the required signature. I figured out something that might be helpful. I did not really want the two dashes in every email that I sent. So I made it a very light color so only I can see it because I know its there but others wont even notice it. This is more of a Word trick, but it's the same idea. Use white text and a tiny font to place text in a style so it get's picked up for a Table of contents entry but is invisible to a reader. Like in a report where the header is different on the section 1st page, but you need the title and style picked up for the TOC.